It was a cloudy, overcast Saturday morning on May 1, 1920. Pitcher Joe Oeschger (pronounced esh-ker) didn’t even think the game would be played, as it had rained most of the morning. And even if it was played, he didn’t think he would be the starting pitcher. “Manager (George) Stallings usually pitched me on Sundays because I went to church”, he recalled. 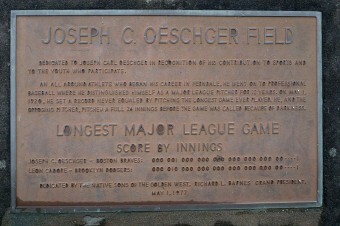 Oeschger did turn out to be the starter for the Boston Braves that day at Braves Field. His opponent would be Leon “Caddy” Cadore of the Brooklyn Dodgers. Oeschger was glad to be going against Cadore that day, as “Caddy” had beaten him 1-0 earlier in the season in an 11-inning pitching duel. “I wanted to even things”, he recalled. The soon-to-be-legendary game started precisely at 3:00 p.m. The Dodgers drew first blood in the fifth inning, when Ernie Krueger scored on Ivy Olson’s single. The Braves came right back to tie the score in the sixth, when Walter Cruise tripled and scored on Tony Boeckel’s single. It seemed like a routine ballgame at the time, a 1-1 tie to be decided in a future inning. Little did either team realize that all scoring was over for the day- and for the next 20 innings. The seventh, eighth, and ninth innings went by and the 1-1 match moved on into extra innings. (In the 7th, Oeschger retired the side on just three pitched balls.) The Braves had a chance to finish the Dodgers off in the bottom of the ninth when they loaded the bases with one out, but Braves second baseman Charlie Pick hit into an inning-ending double play. Both pitchers kept shutting their opponents down, inning after inning. “Cadore had a good curve ball and I had a good, live fastball that day”, Oeschger later said. By the end of 24 innings, the 1-1 tie score remained and the teams were off into unexplored territory, as no game in Major League Baseball history had ever lasted 25 innings. The 25th inning went by scoreless, as did the 26th. By the end of the 26th, plate umpire Barry McCormick saw the lights going on in buildings across the Charles River. He decided to call the game a draw. The players on both teams begged McCormick to change his mind. They wanted to go one more inning, to make it not only the longest-ever game, but the equivalent of three full games. Their arguments and beseechings fell upon deaf ears and the 26-inning 1-1 tie was to go indelibly into the baseball record books. As there were no electric lights in the press box at Braves Field, the reporters and telegraphers had to submit their accounts of the game by candlelight. Some sources list the game’s attendance at 2,000; others have it at 3,500; still others list it at 4,500. Whatever the case, records fell by the dozen. 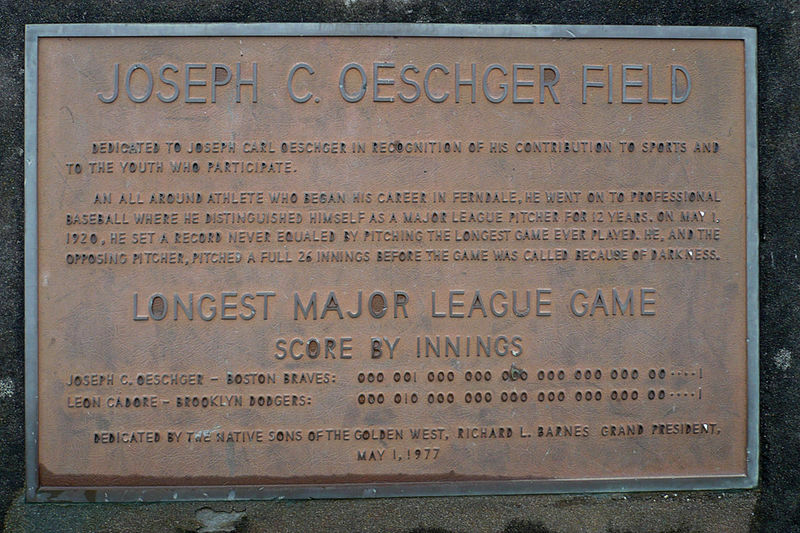 Joe Oeschger’s 21 consecutive scoreless innings pitched in one game seems more an unbreakable record than Joe Dimaggio’s 56-game hitting streak or Pete Rose’s 4,256 hits. The batting “stars” of the day were both Braves- Tony Boeckel, their third baseman, went 3 for 11, while shortstop Walter “Rabbit” Maranville went 3 for 10. After the game, Joe Oeschger stated, “I felt a little tired, but I was more fatigued in some 9-inning games when I got into many jams. There weren’t too many tight situations”. Oeschger did miss his next start, but not because of a sore arm. He pulled a leg muscle running around the park and didn’t pitch again until 12 days later because of the leg injury. There was no game the next day (to, I am sure, the vast relief of both teams.) The Dodgers then went to Philadelphia, where they lost a 13-inning game to the Phillies. The following day, they returned to Boston, this time losing to the Braves in 19 innings. This spell of 58 innings played in three games remains an unparalleled feat as well. And all the Dodgers had to show for it was two losses and one tie. Happily, despite these three games of what must have been unbelievable frustration, the Dodgers did go on the win the National League Pennant that year, before losing five games to two in the 1920 World Series to the Cleveland Indians. The longest game by time in Major League Baseball history happened in 1984 in a game between the Chicago White Sox and the Milwaukee Brewers. The game, played at Comiskey Park, went 25 innings, starting at 7:30 p.m. The game was paused after 17 innings, tied 3-3. The pause was owing to a rule that prohibited any inning to start after 12:59 a.m. The game began again the next day. In the 21st inning, both teams ended up scoring 3 runs, keeping the game going beyond. All total, this 25 inning game included 8 hours and 6 minutes of play. Not only that, but because there was a game following the end of the first game, both teams ended up playing back to back days of 17 inning baseball. Tom Seaver won the above first game in relief, and then started and won the following game played directly after. If this game wasn’t enough, there was actually a single day when two teams played more baseball than the above, in the longest double header in MLB history. These games occurred on May 31, 1964 in a double header between the San Francisco Giants and the New York Mets. The Giants won the first game 5-3 in nine innings. The second game of the double header went 23 innings. The total time for the two games was 9 hours and 52 minutes. During this longest double header in MLB history, one player, Ed Kranepool of the Mets, played all 32 innings. What makes this even more impressive was that the day before he’d been in AAA and had played every inning of a double header there before being called up to the big leagues (no doubt getting little sleep from the excitement, as often happens to players). The longest game in professional baseball history happened in the minor leagues. This was a game between the AAA Pawtucket Red Sox and the AAA Rochester Red Wings. These two teams battled for 8 hours and 25 minutes in a 33 inning game, with 32 of the innings played without a break (the game was called after the 32nd inning and taken back up a couple months later). Rochester was up 1 to nothing in the bottom of the ninth when Pawtucket tied it up. Rochester again took the lead in the 21st inning, only to see Pawtucket tie it up again in the bottom of that inning. Finally Pawtucket scored in the bottom of the 33 to win 3-2. The game started on April 18th, 1981 and finished on June 23, 1981.